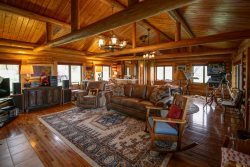 Washaki Cabin is the quintessential cozy, Montana log cabin! This well-appointed, dog friendly cabin is awaiting you for your next Big Sky Escape! Located just minutes (.5 miles) from Big Sky Resort, nestled in a wooded area prime for wildlife viewing, the cabin is great for couples looking for a few days away from it all to take in the breath-taking views of Lone Peak. Big Sky Resort, "America's Biggest Skiing," offers winter enthusiasts 5,800 acres, a 4,350 foot vertical drop, and an average annual snowfall of 400 inches. Lone Peak, at 11,166 feet, offers challenging runs, iconic chutes, and magic carpets. And at the base, it offers kid-friendly beginner runs. - Electric Range,Coffee Maker, Coffee Grinder, Mixer, Toaster, Crock Pot, Blender, Roasting Pan, Bakeware, 3 Place Settings, Basic Spices, Trash Bags, Dish Soap, Dishwasher Soap, Sponge, and Paper Towels.